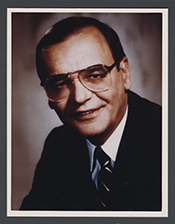 KANJORSKI, Paul E., a Representative from Pennsylvania; born in Nanticoke, Luzerne County, Pa., April 2, 1937; United States Capitol Page School, Washington, D.C., 1954; attended Wyoming Seminary, Kingston, Pa.; Temple University, Philadelphia, Pa., 1957-1961; Dickinson School of Law, Carlisle, Pa., 1962-1965; United States Army Reserves, 1960-1961; lawyer, private practice; administrative law judge for workmen's compensation, 1971-1980; elected as a Democrat to the Ninety-ninth and to the twelve succeeding Congresses (January 3, 1985-January 3, 2011); unsuccessful candidate for reelection to the One Hundred Twelfth Congress in 2010. Videocassettes: 1984-1988, 4 commercials on 2 videocassettes. The commercials were used during Paul Kanjorski's campaigns for the 1984 and 1988 U.S. congressional elections in District 11 of Pennsylvania, Democratic Party. Representative Kanjorski recounts his favorite aspects of Page service. Representative Kanjorski describes the responsibilities of House Pages during the 1950s.